Published by: Hibbert & Stiles Publishing Inc. It's been a long time I have read a detective story though my love for books started from a detective novel 'Sherlock Holmes'. 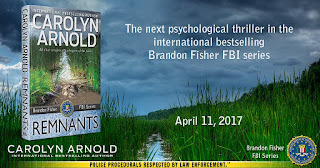 Remnants is a story about the investigation of a serial killer in Savannah, Georgia. Brandon Fisher, our hero detective along with his team work to find out more details about the killer and his motives. One creepy thing about the crime is that it is even difficult to identify victims when the investigation team finds only organs cut and dumped in a river separately. The team has to find out the killer, victims, and even the motive. So, basically, the case starts from nothing. I haven't read earlier books in the Brandon Fisher FBI series, but I loved this book a lot. This can be read as a stand alone. It is a perfect thriller and on the edge mystery. I loved the way the suspense is maintained throughout. Since the author is already a best seller writer, I expected a good read and I am not disappointed. The pace is good for a thriller. The story has enough twists and turns and the author lets us imagine and guess the next move though the story takes unexpected turns. I liked the or writing style which is casual without dragging storyline. PS: I have received a free book in exchange of my review and this is my honest opinion on the book.